I always endeavour to have colour in the garden throughout the year and, of course, it is the winter months that are the most challenging. Plants need to cope with low levels of sunlight, short days, cooler soil and air temperatures, not to mention hard frosts and snowy weather. 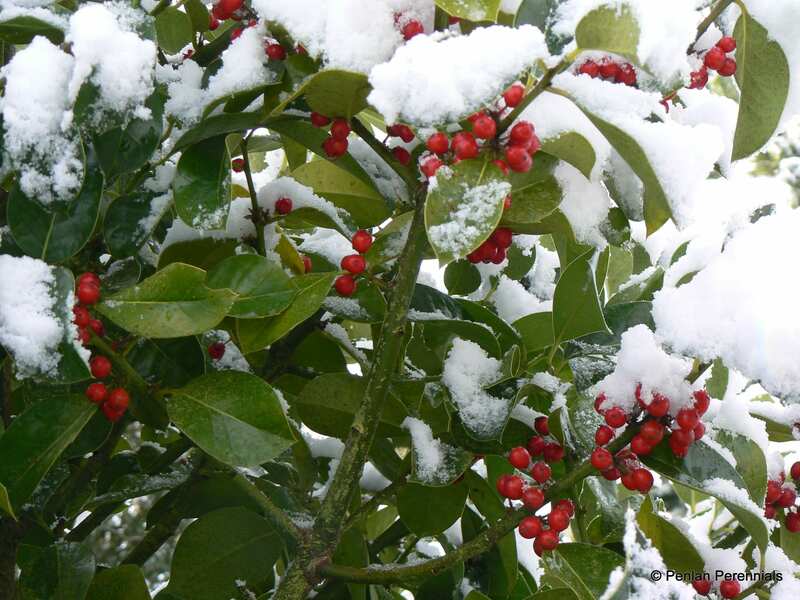 This is why the majority of plants are dormant throughout the winter months, but there are some which do flower at this time of year and others which can offer interest with their fruit or the colour of their stems or branches. By carefully selecting some of these plants and placing them in focal points around the garden you can have colour right through the winter. The first consideration is that you will probably find that the garden is viewed more from the house windows than in close up during the winter! The leisurely strolls round the garden of the summer months are long gone, so in planning for colour in the winter garden you should take account of this and view the garden from the windows or the back and front doors, making a note of where the gaps are in the garden and where a spot of colour would be most appreciated and enjoyed. Once you have a picture in your head of the parts of the garden which will be seen from the house and can be improved it is just a case of finding the right plants! Evergreen plants and shrubs, especially those with some variegation will draw the eye and the low angle of the sun at this time of year can enhance the appearance of plants which are grown particularly for their stems, such as Cornus sibirica (Dogwood) and Betula utilis ‘Jacquemontii’ (the white barked Himalayan Birch). Winter sunlight can also accentuate the dried leaves of architectural grasses, such as Miscanthus sinensis, and perennial flower heads, especially ornamental thistles such as Cirsium rivulare, or the sea holly, Eryngium giganteum. Variegated plants can create a colourful focal point in the garden, especially if they have over-wintering berries, whilst a shrub or climber with scented flowers could do well by a front or back door, where its fragrance can hang on the air. Evergreen, variegated shrubs such as Euonymus fortunei ‘Emerald Gaiety’ soon make a lovely bushy shrub with rounded foliage. The shrub creates winter interest in a mixed border but also climbs if planted against a wall or will work well as a ground cover too, so is extremely versatile. ‘Silver Queen’, ‘Emerald ‘n Gold’ and ‘Harlequin’ are other varieties of the same shrub which mix well together or may be a better fit with your existing planting. These shrubs will all grow happily on alkaline or acid soils. Another good plant for acid soil is Rhododendron ‘Goldfinger’, with its glossy evergreen leaves variegated in the centre with bright yellow. Ornamental hollies, or Ilex aquifolium are also evergreen and can be pruned to keep them shrub-like or allowed to grow into trees. Remember with hollies that, unless they are self-fertile, you need both male and female plants if you would like berries! Some have coloured leaf margins, such as Ilex aquifolium ‘Silver Van Tol’ whilst other such as Ilex altaclerensis ‘Lawsoniana’ have the variegation in the centre of the leaf. Small scale plants for winter colour are easy to find and there is no reason not to have winter hanging baskets or winter tubs – they should not be just for the summer! Tubs and planters work well if you put a small evergreen conifer, mixed with winter flowering heathers and small berry bushes. There are some very colourful yellow or blue dwarf conifers which help add structure and all year interest. Several species even change colour during the winter, especially Thuja occidentalis ‘Rheingold’ (gold in summer, copper in winter) or the globe shaped Thuja occidentalis ‘Danica’ (dark green in summer, bronze in winter). If you use a proprietary multi-purpose compost heathers like Erica darleyensis will thrive giving pink or white flowers from November to April. Shorter Erica carnea hybrids will flower from January onwards – try Erica carnea ‘Vivelli’, which has dark red flowers set against bronze leaves or Erica carnea ‘Springwood White’. For added interest the berries of Gaultheria procumbens (Checkerberry) are scarlet on a small shrub, only 15cm in height. The leaves are aromatic, turn red in winter, and there is the added bonus of small, bell-shaped white or pinkish flowers next summer. Add one or two small leaved, variegated ivies (Hedera helix), such as ‘Caecilia’ which is very compact (the smaller the leaf the more compact the variety) and you have a ready-made winter tub to give you interest into early summer. 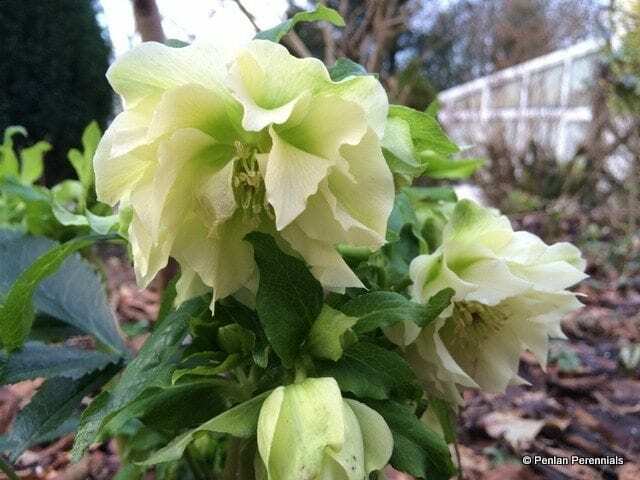 Flowering herbaceous perennials for the winter garden are not quite so easy to find but Helleborus x hybridus (formerly Helleborus orientalis) is a must have plant. Some will start flowering before Christmas, whilst others will flower right through to spring. Choose from a wide range of colours but remember that the single flowered forms hold up better in snowy weather. They can be lying on the ground in heavy snow or sharp frost but bounce back remarkably. When growing hellebores it is very important to cut the old year’s leaves back in late autumn so that you can see the flowers through the winter. The new leaf growth will follow in the spring. Another perennial that will flower reliably in winter months is Hesperantha coccinea. This South African plant used to be called Schizostylis coccinea, but has had a name change! Look for named hybrids such as H. coccinea ‘Major’ which is a bright red or ‘Jennifer’ which is deep pink. They will flower from October to March in milder conditions, only stopping in very harsh weather. For a climbing plant to cover a bare wall, look no further than Jasminum nudiflorum. The bare twining stems are covered with tiny yellow flowers from November through to February. Equally good is the winter-flowering clematis, Clematis cirrhosa var. purpurascens ‘Freckles’, which will flower from November to late February. The creamy flowers are large and the inside is heavily spotted in red. This freckling gives the plant its name. It was introduced in 1989 but does need a sheltered spot, although is hardy to -10C. For a scented climber try Lonicera fragrantissima, a shrubby honeysuckle with heavily scented, delicate creamy white flowers in later winter. The classic winter flower is that of Hamamelis mollis (Witch Hazel) which has lovely sweet smelling flowers and depending on the variety you can have these before Christmas, right through to spring. Flowers are often yellow or orange. Winter flowering Viburnum come into their own from autumn onwards, with white or pink flowers in flushes over the season. Look for Viburnum tinus ‘Eve Price’ which makes a lovely bush to 1mx1m (3ftx3ft) and remains evergreen whilst Viburnum x bodnantense ‘Dawn’ has numerous, densely packed clusters of rose, pink or blush white blooms which are very sweetly scented. In cold gardens bushes flower from January to March, but in mild winters they bloom from October to March with a short break. Don’t forget the bulbs either! There are some very early flowering daffodils such as Narcissus ‘Rijnveld’s Early Sensation’, which is often in flower before Christmas. At the Eden Project, in Cornwall, this daffodil has been known to flower in early November! Among the best of the miniature daffodils are Narcissus ‘February Gold’ or ‘Tête à Tête’. Mix in snowdrops, aconites and crocuses, which can also be planted into grass and make a wonderful carpet underneath deciduous trees, giving successive waves of colour for around eight to ten weeks. With a good mix of these bulbs, perennials, heathers, climbers and shrubs you can easily create a wonderful winter garden to cheer you up on cold and frosty mornings and before long it will be spring as you look forward to another gardening year. Richard Cain is a Fellow of the Royal Geographical Society and after a 25 year career as a teacher and school inspector in the UK and overseas, left education to develop a specialist Plant Nursery in West Wales. Penlan Perennials opened in 1999 and quickly established itself as a leader in the field of environmentally friendly, peat free plant production. The nursery sells online, supplying enthusiastic gardeners, Botanic Gardens, the National Trust, Local Authorities, landscape and garden designers, as well as successfully exporting plants to over 35 countries. When he is not busy at the nursery Richard is a keen photographer and lectures and writes professionally on all aspects of horticulture. Found this an excellent article – thank you. Great to know that we can add winter interest and I will be certainly be following up on this for next year. Thank you Peter. Look out for our next article on Hellebores, due out at the end of the month!